This is maximum productivity in an 18" diameter minibed-on-plastic! These little beds (mulched with lawn clippings) were forerunners of my wood-framed, 30" x 30" Minibeds-on-Plastic gardening idea. My previous essay in this series explained that there is no more effective weed suppressing garden mulch than black plastic. That’s why black plastic mulch has become so popular with so many growers. 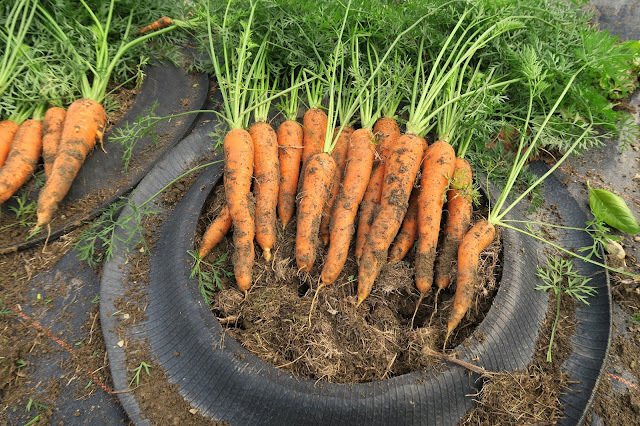 Granted, it's an artificial cover, but a cover nonetheless, and it provides the benefits of a soil cover without the need to import large amounts of natural biomass (i.e., wood chips, straw, hay). The larger a garden is, the more biomass you need for mulch. Black plastic mulch is a biomimetic solution. But there are a couple of discouraging drawbacks to black plastic mulch. First, wind will lift and displace it unless it is somehow secured, and typical hold-down techniques are a bother. Besides that, they often don’t work with complete satisfaction. This matter of wind-lift and hold-down is exacerbated by the fact that the vast majority of black plastic applications use long, relatively narrow strips of the material. Four foot wide plastic is typical. In the Minibeds-on-Plastic gardening system, wind lift is NOT a problem. That’s because a single large sheet of black plastic is used and it is securely weighted down by numerous, precisely-spaced minibed frames. For example, my Minibeds-on-Plastic experimental garden was made with a 24’ x 44’ sheet of plastic and it has 45 minibeds. The perimeter of the single large sheet is secured by burying the edges in a shallow trench, weighting them down, or pinning them in place. I’m using a combination of all three methods. 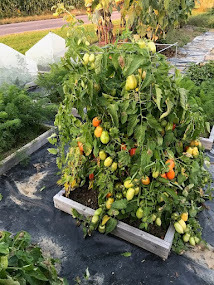 The reliability of the Minibeds-on-Plastic approach to plastic hold-down proved itself here (upstate New York) in the 2017 experimental garden last month. We had a February thaw. My whole garden was bare, and there was a significant wind storm. The wind lifted several sheets of sheet-metal-roofing that I use in part of my garden to mulch a walkway. The metal has been in place for years with no problem. But the big winds lifted and tossed the metal sheets. The wind also displaced several weighted-down plastic sheets I was using for occultation covers on some long raised beds. However, my Minibeds-on-Plastic experimental garden, which is right next to the sheet-metal walkway, was totally unaffected by the winds. It was a true test that the experimental garden easily passed, and I was well-pleased to see it. The other common problem with black plastic mulches is that they are thin and only made to last for one season. So, if you use the long strips, you have to pull them up and dispose of them every year. That’s a hassle. But with the Minibeds-on-Plastic approach, the large plastic sheet stays in place for several years. Eventually, the plastic will need to be replaced, but if a thick, UV resistant plastic is used, it should last. I’ll be evaluating the longevity of the 6mil, UV resistant bunker cover I’m currently using. I hope to get at least three years of useful life from the material. Tom Dolye, the man who inspired me to eventually develop my Minibeds-on-Plastic garden, used a single, large sheet of specially formulated black plastic that reportedly lasted for decades. Perhaps the inexpensive, recycled billboard plastic tarps, which seem to be more durable than the 6-mil bunker cover, will last that long. I plan to establish a small Minibeds-on-Billboard-Tarp garden this spring. The only real drawback I can see when using black plastic as a garden mulch is that it does not feed the soil and soil biology, like a natural mulch does. But with my Minibeds-on-Plastic gardening system (which, I should add, is still in the experimental stage) each 30” x 30” minibed will will have a natural mulch for soil cover. I will be planting different cover crops into the beds in order to establish root biomass. The root mass of some cover crops far exceeds their aboveground biomass. 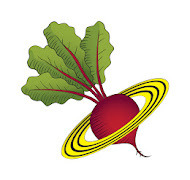 I will focus on maintaining a steady, rotating supply of different root biomass into each minibed. 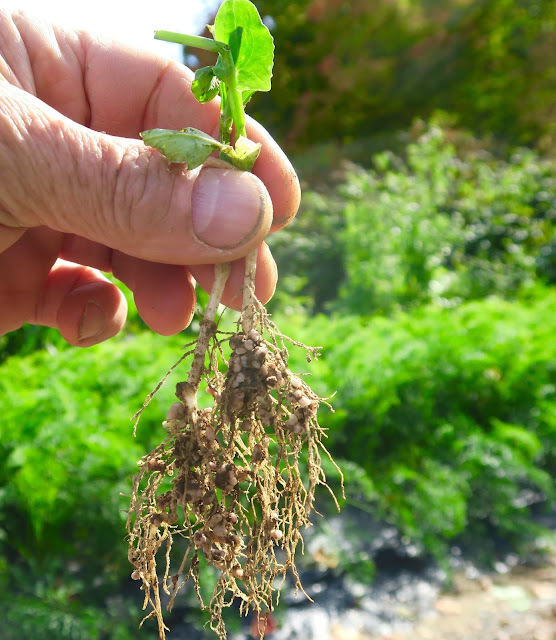 I once heard Elaine Ingam say that “massive aboveground biomass is biomass in the wrong place.” She said that because roots, live and dead, feed the soil biology in a very tangible way—especially if those roots are in a no-till garden bed. And those roots will extend into the soil well beyond the perimeter of each minibed. The mention of no-till gardening brings me to the the other important aspect of my Minibeds-on-Plastic garden system… I will not be digging the soil in the minibeds. There will be shallow cultivating occasionally, and minimal disturbance when transplanting, but no tilling, no double-digging, no turning of the soil. All plant roots will be left in place (unless, of course, they are part of my harvested crop). As I recall, this garden bed was planted to spinach. 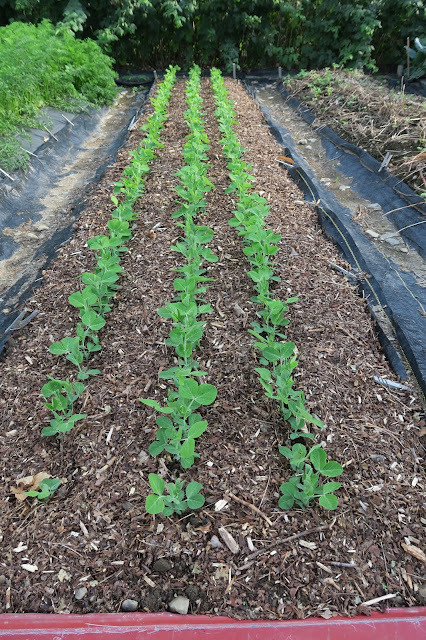 When the spinach crop went by, I cut the spinach plants at ground level and planted three rows of peas, without cultivating the soil. Once the peas were up, I shallow-cultivated the bed to eliminate weedlings, and mulched with shredded leaves, as you can see in this picture. 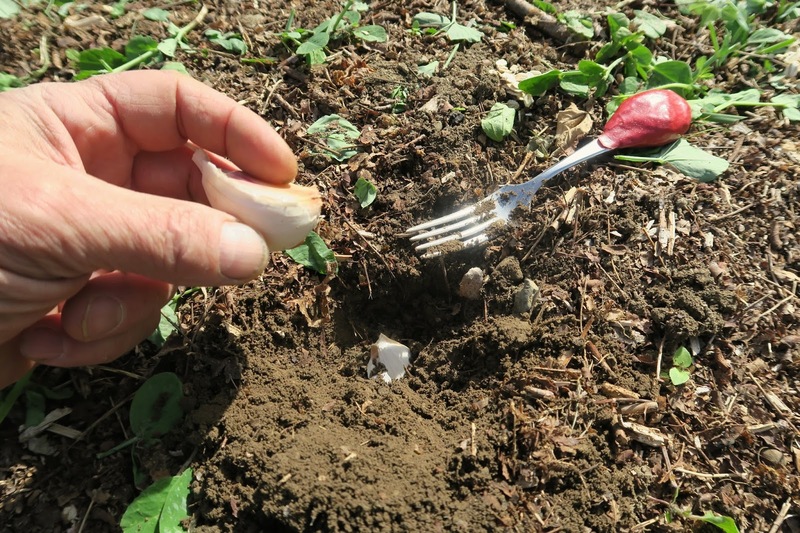 When it came time to plant garlic in the bed, I cut off the pea plants, leaving the roots in the soil. This picture shows a couple of roots I pulled up to see if there were many nitrogen-fixing nodules... and there were! In this picture you can see that I am planting garlic into the bed. The soil is undisturbed except for the holes I made to plant each garlic clove. If any pea roots were in the way of my planting spaces, I removed them. The soil in the bed had beautiful tilth. After planting the cloves, I mulched the bed with a heavy cover of shredded leaves. That bed is now covered with snow. The objective with this no-till approach is not to save work (though it does save work), but to preserve soil structure and inflict minimal damage to soil life. It is the biology in the soil that feeds plants. We need to preserve and promote that soil life. No-till gardening does that in a profound way. If you have not yet watched the Ray Archuleta series on soil health, Click Here Now and watch it. After watching that series, you will understand the importance of no-till. So, my point is that the soil directly under and adjacent to every minibed is going to be husbanded with an eye towards soil health. There is more that I could write about this, including the importance of oxygen in the soil, and how a plastic mulch actually contributes to the proliferation of oxygen in the underlying soil. I know that sounds backwards but it's in my Minibeds-on-Plastic Report, which goes into some depth explaining Tom Doyle’s thoughts on “oxygen fertilization.” The first time I read it, I thought Mr. Doyle was promoting a nutty concept. But he was onto something. I recently heard soil-health advocate Jerry Brunetti say on a YouTube presentation that "oxygen in the soil is the number-one fertilizer." The Minibeds Report also goes into some depth discussing Tom Doyle’s experience of never needing to water his plastic-covered garden. Oh, one last thought… When growing a cover crop in the minibeds, the aboveground biomass can be cut up and used as a natural mulch in the beds. Or, it can be composted. Or, it can be spread over the black plastic as a cooling cover in the hotter months. If a mature cover crop in a minibed is so dense on the surface that it’s not possible to plant the next crop into it (or if the topgrowth needs to be severed from the roots to stop the cover crop from growing), my plan is to harvest the cover crop low, then slice the dense mat of stem and root vegetation into manageable sections with an old knife. Then I'll cut the plants just below the surface and flip the biomass over to use it as a mulch layer (the aboveground biomass will never be tilled into the bed). This kind of operation would be tedious on a large scale, but it will be much simpler in a minibed. And this is a good place to end this series of essays. As you can see, Minibeds-on-Plastic is an integrated system of gardening that is very manageable. 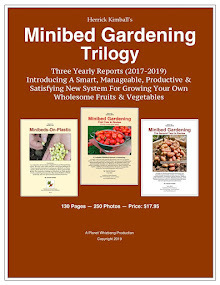 It allows for focused attention on a diversity of garden crops in small growing plots (as opposed to the whole garden) with the goal of high-culture and maximum productivity. Manageability, efficiency, and productivity is what will result in maximum satisfaction. That's my "theory" with Minibeds-on-Plastic. The upcoming 2017 Minibeds-on-Plastic experimental garden will prove the validity of my gardening system.... or not.